PORT-AU-PRINCE, Jan 12 2012 (IPS) - For two years now, since her husband was one of the estimated 230,000 Haitians killed in the massive earthquake of Jan. 12, 2010 and she and her three children became homeless, little has changed for Dieulia St. Juste. A 38-year street vendor, she is still living in a tent camp next to the crumbled National Palace. On the eve of the second anniversary of the earthquake, which affected an estimated three million people in what was already the poorest country in the western hemisphere, St. Juste was not optimistic. “I think things are getting worse for the people who live in the camps. If I had the means, I would not stay here,” she said. Of the 1.3 million people sheltering in over 1,300 camps a year ago, there are now about 500,000 people in 750 camps. 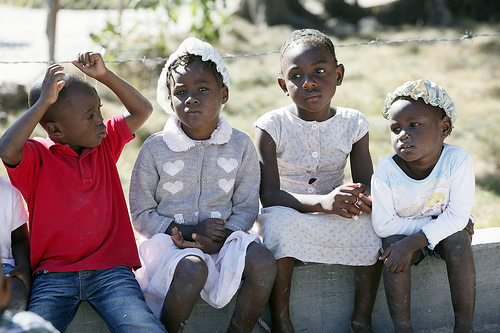 However, according to investigations by Haiti Grassroots Watch and other researchers, the majority of those moved out of the camps are back in the unsanitary slums, and many currently live in housing damaged during the earthquake and marked “red” by engineers – meaning it should be destroyed. Others are on the precarious hillsides in makeshift homemade shelters, shoddily built concrete shacks, or in one of the approximately 100,000 “transitional shelters” meant to last three years and built with some 200 million in aid dollars. Many more millions have been spent maintaining the camps. Relatively little has been spent on reparations and new housing, although some small projects – 400 houses here, 1,000 houses there – are currently in the works. According to the U.N. Foundation, since the earthquake, the United Nations and its partners have provided 1.5 million people with shelter, clean water, and access to latrines; 4.3 million people with food aid; 1.5 million emergency and reproductive health kits; 750,000 children with free education and school supplies; and supported the removal of more than half the rubble. A recent analysis by GiveWell, an independent, non-profit charity evaluator, found that 5.2 billion dollars has been raised or pledged, and about 1.6 billion dollars has been disbursed so far on relief and recovery efforts. However, Renel Sanon, organiser and executive secretary of the Force for Action and Reflection on the Housing Issue (FRAKKA by its Haitian Creole acronym), says the socio-economic situation of most displaced people is actually worse today. “There has not been any improvement in their living conditions, despite the exorbitant sums that have been spent,” he said. Sanon added that housing cannot be addressed in a vacuum. The government should also be working on providing water, sanitation, health care and education for its citizens. Antonal Mortiné, executive secretary of the Platform for the Defense of Human Rights, which groups together half a dozen Haitian human rights organisations, said that the right to housing has been systematically violated by the Haitian government and its partners. “The displaced, the ones first concerned with the process of reconstruction, are totally excluded. When making its plans, the state doesn’t take them into account at all,” he said. Marie Felicia Felix, 41 and handicapped, lives in a Red Cross/Red Crescent-built plywood “temporary shelter” in a camp set up at the old military airport, called “Airstrip Camp.” She lost a leg on Jan. 12, 2010. “I am living better here than when I lived in a tent in the Jean- Marie Vincent Plaza Camp. I feel okay here. I’m not worried when it rains,” she said. “Of course, we don’t have much infrastructure, like electricity or water, but it’s still better than before. But I don’t see any real efforts by the authorities to really reconstruct the country. “In fact, us handicapped people are forgotten in the big decisions being taken. None of our leaders has ever come to visit us here,” she said. The numbers of people handicapped by the earthquake vary, but some reports say there were as many as 4,000 amputations performed in the days following Jan. 12, 2010. Handicap International reports that it has fitted about 1,500 orthopedic devices and distributed about 5,600 “mobility aids” such as canes. The group notes that some disabled Haitians still haven’t received needed prosthetics and rehabilitation therapy. But the most pressing health issue remains the ongoing cholera epidemic, which broke out in October 2010 and is the worst recorded in modern history. Speaking a U.N. press conference on Jan. 6, Dr. Jon Andrus, deputy director of the Pan American Health Organisation (PAHO), reported that, “As of mid-December 2011, we registered 525,000 cases and 7,000 deaths in Haiti, and 21,000 cases, 363 deaths in the Dominican Republic (with which Haiti shares the island of Hispaniola). “We really need to refocus national and international help to fight this epidemic,” Andrus stressed, noting that there continue to be 200 new cholera cases every day. According to the Washington-based Center for Economic Policy and Research (CEPR), numerous scientific studies have found a clear link between the cholera strain in Haiti and the U.N. peacekeeping troops stationed at a base in Mirebalais, near the Meille River, where the outbreak began. Petitions for damages from the U.N. have been filed by U.S., Haitian, and Brazilian-based organisations on behalf of thousands of cholera victims. “People’s lives continue to be endangered, and justice denied because of U.N. negligence, and the U.N.’s refusal to take responsibility,” said CEPR co-director Mark Weisbrot. While billions of dollars were pledged for relief and reconstruction, an analysis published in early January found that only one percent went to the Haitian government. Four-tenths of one percent of the funds went to Haitian NGOs. Professor Jean-Yves Blot, an anthropologist and vice dean of research at the Faculty of Ethnology, State University of Haiti, and a contributor to the newly published book “Tectonic Shifts – Haiti Since the Earthquake” (Kumarian Press, 2012) decried the perceived failure of the Haitian state. “We think the problem is with us, that we don’t know how to manage, that we have ‘governance’ challenges,” he said. “I just visited a vodou community that has existed for 220 years. That shows that we Haitians do know how to manage things! Haitians have a lot of expertise in management and ‘governance,’ but propaganda makes us believe that we need foreign experts. *With additional reporting from the United Nations in New York by Mathilde Bagneres. Jane Regan and Sylvestre Fils Dorcilus are members of Haiti Grassroots Watch (HGW), a partnership of AlterPresse, the Society of the Animation of Social Communication (SAKS), the Network of Women Community Radio Broadcasters (REFRAKA), the Journalism Laboratory at the State University of Haiti, and community radio stations from the Association of Haitian Community Media. IPS is pleased to have worked with HGW since the earthquake to reprint its investigations into how reconstruction and recovery funds have been spent, and issues of transparency or accountability by NGOs and the international community.